Also known as Blue Spring Ride, this is a romance anime with a fresh take on the genre. Main character Yoshioka Futaba meets a boy called Tanaka Kou one day, whilst they're taking shelter from the rain on the grounds of a shrine. There they seem to take a liking to each other which results in Kou asking her out on a date. Futaba says yes and waits for him at the chosen location, only for him to not show up. She soon learns that he's moved school. Upon starting high school, Futaba decides to start anew by creating a new personality for herself: one that would get her to make friends easily with other girls, and would be a major turn off for guys. The reason why she does this is revealed within the first couple of episodes, but the bigger (and unexpected for her at least) thing to happen is her reunion with Kou. He doesn't seem interested in her any more and goes by the name Mabuchi Kou (also explained), in addition to seeing through her new personality. This reunion makes Futaba question the new her as well as the new Kou, constantly thinking of the old Kou from middle school and calling him Tanaka so she doesn't lose that part of him. There are times when she reminisces and you see how cute and subtle their relationship was and how their new "relationship" is significantly different. Now that Kou is back in the picture, things do seem like they'll go back to how they were, but with the long gap between then and now, it may not be completely the same. Her feelings for Kou develop in each episode though, which is cute and I guess relates more to reality than other romance anime. At times it looks like Kou is going to open up to her rather than be the closed-off guy he has become, but then the moment is ruined. Why?! Anyway, his character and Futaba's kind of remind me of the couple from Ookami Shoujo to Kuro Ouji, since Kou has also gone through a traumatic event in his life. But Futaba is less in your face than Erika is. 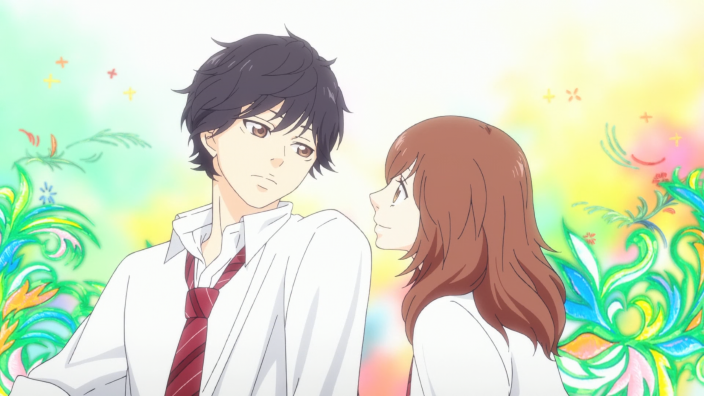 Ao Haru Ride doesn't just focus on how Futaba is trying to find herself through high school; she's also making friends, which doesn't get off to a good start (it's quite funny). It adds meat to the story, not that it was bad with just the romance side of things, and by meat I mean those new friends have their character developments which changes things around, whether it's love triangles, opening up to others and changing their views on things for example. Because of these events which occur, you may be able to tell that these friends are the usual bunch that arises in anime: the pretty/cute one who falls in love with the main guy; the quiet one who eventually opens up and is really caring; and the tag along friend of the main guy who is able to break the mood, and develops feelings for one of the friends/main girl. Whilst the Futaba and Kou relationship is one to watch, the inclusion of additional characters makes for a stronger story and interesting times after mixing this in with the "fast but steady" pace. They have an influence on the story whether it's between themselves or if it affects Kou and/or Futaba. This anime is definitely one which you should watch whether you're a guy or a girl, as its progression will make you want to continue on to the next episode once you finish watching the current episode you're on, and each episode gets progressively emotional. It's not a bad thing considering it only has 12 episodes, but if you enjoyed it as much as I did, you'll want to read the manga straight after.